A government advert which claimed the new Diploma would get teenagers into "any university" has been ruled misleading by the official watchdog. The Advertising Standards Authority said the radio and press adverts were misleading because not all universities accepted all five Diploma courses. It also noted that Cambridge only accepted the engineering Diploma if it was taken alongside A-level physics. The Department for Children, Schools and Families disagreed with the ruling. The Children's Secretary Ed Balls has said he hopes the Diploma, which combines theoretical and practical learning, will become the qualification of choice. The government began a national media campaign to raise the profile of the qualification, which has to compete alongside the long-trusted A-levels. The radio advert stated: "When you're thinking about what qualifications to take, have a look at the Diploma ... a qualification for 14-19-year-olds that's accepted by all universities.... The Diploma, opening the doors to university and work." The press advert showed open doors with a scarf, pen, laptop, microphone, paintbrushes, satellite and microscope bursting through them. 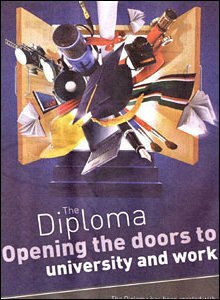 The accompanying text said: "The Diploma, opening the doors to university and work... an Advanced Diploma, equivalent to 3.5 A-levels, can get you into any university." The radio and national press adverts attracted two complaints. They questioned whether the phrases "accepted by all universities" and "can get you into any university" were misleading because they understood that Cambridge University only accepted Diplomas in one subject. And back in August research for the DCSF found that although most universities would accept candidates with Diplomas, most would need at least one A-level too. The ASA upheld the complaints, saying the adverts had breached rules on "misleadingness, substantiation and truthfulness". It also said the adverts' claims implied all Diplomas represented a level of qualification that would be accepted by all universities. The DCSF rejected the ruling saying it had worked with universities to make sure they were happy with the ad campaign. A spokesman said: "We worked closely with the Universities and Colleges Admissions Service (Ucas) to ensure they were content with the accuracy of the advertising messages. "The Radio Advertising Clearance Centre (RACC) also agreed that the ad was not misleading." Shadow Children's Secretary Michael Gove said: "Ed Balls boasted that his new Diploma was on course to overtake the A-level and become the qualification of choice for young people. "But universities aren't impressed, teachers are confused and students have shunned the course." He added: "So, in desperation the government spent millions on an advertising campaign which has now been exposed as dishonest." Liberal Democrat children's spokesman David Laws said it was "truly extraordinary that this government's spin operation has got so out of control that even the ASA is having to rap them on the knuckles for blatantly untruthful claims". He continued: "Ed Balls must apologise for misleading people about the Diplomas."